Taking off from its climatic range - Himalayan to tropical - India has much to offer in terms of fruit diversity. Large varieties of major fruits are native to the land, but countless other types are also grown throughout India. The bad news is many, many varieties of fruits have already vanished and some are on their way to extinction. Indeed, it is the commercially viable ones that survive well. Deforestation and habitat destruction are also causing genetic erosion of fruits. Though fruits can change the economic lives of a large number of our people, government efforts at preservation are way below par. Fruits come in all shapes and sizes. Neatly stacked in wooden crates and placed under bright lights, the fruit markets attract buyers from each and every stratum of society. Vendors call out to advertise their wares, mouth-watering delicacies exchange hands for printed pieces of paper as quick deals are struck between haggling housewives and clever sellers. But behind the garish lights is concealed a harsh reality. Even as the market place seems to be teeming with fruits, the genetic biodiversity of fruits in India is being rapidly eroded. Fed up eating just bananas, mangoes or grapes, you decide to check out if the fruits you relished in your childhood are still available. But there is nothing the market has to offer other than the more common varieties. You ask for khirni, and the reply is, "Does anyone buy khirni nowadays?" The answer is no different for other lesser-known fruits. By the end of the gruelling session through the market, you're left wondering where all the fruits you grew up with have gone. India has much to offer in terms of fruit diversity. The country can boast of as many as 50 indigenous fruits. And if you take their wild relatives and allied species into account, the number of native varieties goes up to a whopping 400. Found in diverse climatic conditions (see map: Fruits of India), some of the native fruits are mango, banana, citrus, jackfruit, aonla (Embilica officinalis), jamun (Syzygium species), ber (Zizyphus species), bael (Aegel marmelos), chironjii (Buchanania lanzan), ker (Capparis decidua), karonda (Carissa carandas).... The list is endless. 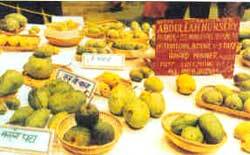 Of these, varieties of major fruits like mango, banana and citrus are grown in abundance in many parts of the country. There are also some commercial varieties - pineapple (Ananas comosus) and papaya (Caria papaya), for instance - which are not native to the country but are cultivated over large tracts of land. Minor tropical fruits which are basically collected from the wild and eaten by the local inhabitants include her, bael, jamun, karonda, aonla, fig (Ficus carica), phalsa (Grewia subinaequalis) and kokam (Garcenia indica). Besides, there are the "under-utilised" fruits like the tamarind which exhibit rich diversity, but are not commercially important. Their cultivation is restricted to small farms, backyards or marginal land which is not suited for commercial fruits. The choice of species also depends on the multipurpose use of the plant. Fruit diversity is found in abundance mostly in the jungles or untapped regions. However, consumption is restricted to the growing areas due to various factors. For instance, the passion fruit which is in great demand in Mizoram is not seen anywhere else because of the poor communication link the state has with the rest of the country. Some of the fruits found in the wild are yet to be sampled adequately, leave alone marketed. But with no incentive available to the growers to cultivate these lesser-known fruits, several varieties are on the verge of extinction. Though the area under fruit cultivation and fruit production have gone up over the years, it is at the cost of a number of native fruits. Just a few are being produced, with preference being given to commercially viable ones, not necessarily native. 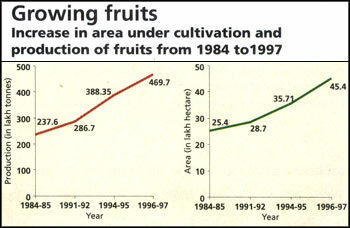 And even in the fruits that are being produced, the varieties are limited (see graph: Growing fruits). • Collection and conservation of genetic diversity is not a national priority. Though fruits comprise 25 per cent of agricultural exports, only 7.7 per cent of the agricultural budget is allocated to horticulture. • Even the germplasm that has been collected has not been documented, evaluated or characterised. • Efforts at exploring diversity within fruits is still at a primary stage. • S Lack of a ready market for most fruits is leading to cultivators shifting to more commercially viable fruit varieties, which are not necessarily native. Unless we have a fruit policy, what you find in the market today may not be there when you decide to go fruit shopping next. MANGO: Known as the king of fruits, India is blessed with mango diversity. Wild forms of Mangifera indica (mango) can be found in the peninsular tract, the evergreen forests in the Northeast and the terai regions. Wild forms of the allied species, M sylatica, are also found in the evergreen forests. Four of the 41 Mangifera species are native to India. Dominant areas of diversity are the humid tropical southern peninsular; the Andaman and Nicobar islands; and the humid subtropical region comprising-Manipur, Tripura, Mizoram, southern Assam, Chotanagpur plateau, Santhal region in Rajmahal hills, southern Madhya Pradesh and the Thar plateau adjoining Gujarat and Rajasthan. Besides, Kerala and the Western Ghats form the secondary centre of mango origin in the world. This region boasts of a number of mango varieties known by local names - for instance, muvandan, chakriyan, puliyan and muttikudiyan - and are mainly used for pickles and making other culinary delights. The number of mango varieties (varieties with-in a specie) found in India is a whopping 1,000, ranging in size from a peanut to a musk melon. Of these, quite a few are unique and several widely grown. Many mango varieties have been made possible by hybridisation, a process that has opened up endless possibilities. Two desired mango plant varieties are grown close to each other. Thereafter, it's a game of wait and watch for a new variety to emerge. Any number of varieties can be hybridised. And often, owners of mango orchards tend to get carried away. The owner of Abdullah Nursery, Haaji Kaleemullah Khan, in Malihabad is a proud owner of a mango tree that has more than 200 varieties on it. Another possibility is grafting, a way of mass propagation, where a cut is made in the twig of the desired variety and is latched on to a "mother plant". 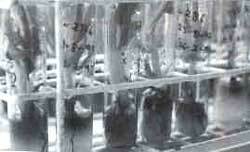 Collection of the genetic resources of mangoes dates back to the 16th century. And credit goes to the Mughal rulers who planted seeds of all the fruits they liked. The Mughal rulers and Avadh nawabs in Uttar Pradesh planted a lakh of mango seedlings in some orchards known as lakhabagh. Many of these orchards still exist, although in a pitiable condition. Diversity multiplied as the rulers, often fruit fanatics, ordered the good varieties brought by their subjects to be planted in their gardens (see box: Mango mania). The names given to the different varieties have interesting origins, too. The dussehri mango is named after the Dussehri village near Malihabad, not far from Lucknow, the mango belt of Uttar Pradesh. Legend has it that the "mother" tree still exists in the village. Some were named after the flavour, some after the shape and a few were dedicated to a lovelorn begum. Hence the name sophiya (which tastes like saunf or aniseed); karela (ridged like a karela or bitter gourd) and hussnara (fine appearance with an equally fine taste). In the early 1900s, attempts were made to collect and document different mango species in a systematic manner. However, the collection that currently exists in India mostly contains cultivars which were distributed to farmers as grafted seedlings, leading to the disappearance of the less desirable, usually seed propagated, cultivars. "A lot of mango germplasm with variation in leaf shape, size, orientation, colour, fruit shape, quality and aroma have already disappeared," says M L Jyothi of the Kerala Agricultural University in Thrissur district. "And the future of what is left is alarming," he adds. Over the years a lot of genetic erosion has also taken place due to deforestation and urbanisation. Genetic erosion of these cultivars is a serious problem in the whole of Southeast Asia. BANANA: Acknowledged as the fruit of the masses, banana is India's most favoured fruit. Available throughout the year, banana sellers are tracked down by buyers - students staying in hostels, bachelors on their way to a kitchenless residence, and householders in search of nutrition. Available in all shapes and sizes, the fruit is loaded with calcium, potassium, sodium, phosphorous, iron and vitamins. The flower also has medicinal qualities and the leaf is used as an eating plate in many parts of the country. India is the world's second largest cultivator of bananas and boasts of several native species. The fruit can be found in various geographical locations - from the sea level to 1,500 metres above mean sea level. Several wild species have been identified in the Northeast region, which, along with the northern peninsular region and the Western Ghats, are major banana diversity centres. But one-fourth of India's banana harvests comes from Tamil Nadu. The state cultivates more than 80 banana varieties, the most popular being malai, mondan, poovan, peyan and rasthali. While gene pools of bananas grown in South India have been well analysed and characterised, the same cannot be said of those found elsewhere, though several exploratory trips have been made by the National Bureau of Plant Genetic Resources, New Delhi, and its units located in different parts of India. Although India is a major centre for banana diversity and several attempts have been made in the past to conserve the germplasm in gene banks, a lot of confusion exists because of synonyms (same varieties are assigned different names depending on the geographical location) and the fact that many of the species in the gene bank still remain uncharacterised. There is also a need to find virus-resistant varieties (see box: Bananas at risk). CITRUS: A few citrus species are believed to have originated in India - the major centre of diversity being the Northeast. Parts of northwest India, peninsular region and the Western Ghats are also home to some species. However, in spite of efforts since the turn of the century to preserve the fruit, genetic erosion is still taking place. The Northeast is blessed with citrus diversity with as many as 17 species originating here, but whatever germplasm that was collected in the Northeast in the 1950s is lost already. The fruit grows at locations which are 300 to 400 metres above mean sea level. The western parts of Aizawl district in Mizoram and Jampui hill area in north Tripura show rich diversity. Citrus reticulata, C limon and C grandis are commonly found in backyards and orchards. However, monoculture of economically important species is replacing less preferred species like hatkora (C macroptera), not popular because of its high acidity and ascorbic acid content. Sishuphal (C megaloxycarpa), found in the Jampui hills, is already labelled endangered. "The situation is such now that fruit vendors pass off oranges from other states as that grown in Cherrapunji, when oranges are no longer found there," says A Wallang, Northeast regional programme co-ordinator of World Wide Fund for Nature, India. MINOR FRUITS: The tribals of Maharashtra have been maintaining the ancient tradition of collecting karonda (Carissa) from the wild for sale in nearby markets. Resistant to most diseases, the hardy plant is used for various purposes by the tribals: the branches are cut and used as fences to protect agricultural fields, and dry twigs are used as firewood. The Konkan region boasts of a rich diversity but in the dry eastern regions of Aurangabad, where the population is scattered, the plant's survival is endangered. Unfortunately, according to V S Ghate of the Agharkar Research Institute in Pune, the species have hardly been studied for natural variability and horticultural practices. Aonla is another minor fruit native to India. However, it may soon get the status of a major crop as the area under aonla cultivation is increasing at a rapid pace. Even wastelands are being used for its cultivation. Rich in vitamin C, the demand for aonla is on the rise. It is being processed into plant-based healthcare products - chyawanprash, for instance. Also, it is generating income for tribals engaged in its cultivation. Minor fruits have not been exploited because there is no demand for them, says K L Chadha, horticulture professor, Indian Agricultural Research Institute. He, however, is the man behind the "her revolution". Chadha studied 67 varieties of the native round her-often referred to as galagottu, meaning if eaten, the sourness catches the throat - and came up with a scientifically improved tastier her variety. This also helped augment the economic status of indigenous people who were involved in its cultivation. "No one can hate this fruit," says Zoramthanga, leader of the Opposition in the Mizoram state Assembly, of saptheior the passion fruit. Found in the Mizo hill tracts, its popularity, however, is limited to the state due to lack of transport facilities. Passion fruit juice has a great potential but as of today there are no markets. Villagers in Champhai district were encouraged to grow the fruit. But the nearest processing plant being 300 km away, the cost of transportation was way beyond the farmers' means. In anger, the villagers dumped the fruit in the streets of Champhai. Besides diversity in minor fruits like aonla, ber, bael, custard apple, jamun, phalsa, tamarind and karonda, there are other tropical fruits that are yet to be exploited and their genetic base explored and enhanced. These include barhal (Artocarpus lakoocha), chironji (Buchanania lanzan), dillenia (Dillenia indica), makhana (Euryale ferox), manasari (Mimusops elengi), rose apple (Syzygium jambos), hogplum (Spondias pinnata) and tropical almond (Terminalia catappa) (see box: Makhana, more of a medicine). Besides, there are fruits specific to ecosystems - the Himalaya and the Thar desert, for instance. The great Indian desert, Thar, is a contradiction. Locally known as marusthali - the land of death - this hostile environment, however, has been home to one of the finest biodiversity in India. As the local saying goes, "Marwar mein, barah kos mein, boli, jeev aur vanaspati thodi badle" (in Marwar, every 36 kilometres, the dialect, flora and fauna change), this diversity, extending to fruits, is remarkable. However, the desert awaits people to savour its fruit varieties, and its fruits are in dire need of conservation, (see table: Desert fruits). The Garhwal Himalaya is an important source of wild fruits, growing abundantly along the altitudinal gradient. Though rich in proteins and carbohydrates, these fruits are yet to be considered as a food source. They also have the potential to be commercially processed into jellies, jams, squashes and sauces. This will not only increase the earnings of local communities but also help in conservation. "There are 36 varieties of edible figs, some of which are native, to the Himalayas. These figs could be used to make excellent jams," says A N Purohit, director, High Altitude Plant Physiology Research Centre at Srinagar, Garhwal. "Of the total 190 Berberis (kingora) species, 13 are found in India, mostly in this region," says R K Maikhuri, scientist at the G B Pant Institute of Himalayan Environment and Development at Garhwal. "It's unfortunate that the fruits of almost alt wild plants which grow in the Himalaya are wasted, in spite of their medicinal and commercial worth. Efforts to improve them are negligible," he adds.  Germplasm forms the basis for collection and conservation of any fruit species, most importantly, for future breeding programmes where breeders look for desired traits in a particular fruit. Several attempts at conserving germplasm in gene banks have been far from satisfactory. "This problem is particularly true for fruits from the Northeast," says Chadha (see box: Fruits of Mizoram: a lost case). An assessment of 32 indigenous fruits to check erosion of diversity that has taken place in the wild as well as in cultivated species had nothing good to state. There is evidence of erosion in all varieties with "medium" erosion in 50 per cent of cultivated fruits and "high" erosion in the rest. As for fruits growing in the wild, 56 per cent are facing "medium" erosion and 44 per cent "high" erosion. The fruits that were assessed include banana, citrus, mango, aonla, amra, wood apple, bael, and plantain, her, fig, jackfruit, jalpai, jamun, karonda and khirni. "The genetic erosion of a number of indigenous fruits has been high," admits Mathura Rai of the National Bureau of Plant Genetic Resources, New Delhi. Absence of a central germplasm management system to co-ordinate field gene banks in various places is taking its toll on conservation efforts (see table: Losing colour). Confusion over germplasm synonyms - bananas, for instance - is yet to be sorted out. Reliable characterisation of the different species and varieties based on biochemical and genetic parameters are yet to be carried out in the Northeast. A 40 per cent decline in the mango germplasm collection at the Institute of Subtropical Horticulture, Lucknow, has been reported. And if this is the state of major fruits, like banana and mango, the plight of the minor ones may well be imagined.  There is no delineation between base collections which act as a sort of insurance, and working collections which are used for research and breeding purposes. Unsupported by data giving the profile of the plant collected and subsequently stored, proper utilisation of the data in the future will certainly be a problem.  Realising the potential of commercial crops, farmers are shifting over to economically viable varieties of fruits, not necessarily native, which have a ready market. This has been observed in the case of the declining citrus groves in the north-eastern states and the old mango orchards of Uttar Pradesh, West Bengal and Andhra Pradesh, Virtually no markets exist for minor fruits besides the place where it is found, and there is no encouragement from the horticulture department.  The intimate relation between native communities and bio-diversity is underestimated, too. Locally useful diversity has not been assessed to promote socio-economic gains to indigenous communities living in diversity-rich areas. Through the decades, these communities have been growing an array of species, gathered valuable information on conservation, use of resources, and have also understood their useful traits. Such information is helpful in assessing potentially useful germplasm, trends in domestication and cultivation of local species. Local knowledge on the use and conservation of native diversity is poorly documented. It not as if only the scientists were responsible for improving the varieties of certain fruits. Chaddha recalls two varieties of disease-resistant grapes that were developed by indigenous communities in Maharashtra. The Tas-e-Ganesh variety of grapes was produced by a farmer. Created from Thompson seeds, the quality of the raisins as well as the shape of the fruit is of high quality. Another farmer from Sangli, Maharashtra, worked on the impressive Russian Kishmish Chorni variety using a plant regulator, gibrellic acid and came up with a highly-sought seedless sharad grapes. The grapes are much larger, attractive and taste better. R K Arora, co-ordinator (retd), International Plant Genetic Resources Institute, sums'up the current status. "Not all tropical fruits' diversity is well-collected. Under-utilised species and wild relatives are poorly represented in terms of conservation, evaluation and documentation of what has been collected. Proper assessment of the genetic diversity is not carried out. Maintenance and conservation is a problem. Wild type diversity is being lost due to habitat deterioration, changes in land-use practice and crop diversification programmes. Documentation and dissemination of information leading to better utilisation of information is required." Conservation is a positive step towards preservation, maintenance, sustainable utilisation, restoration and enhancement of the natural environment with its diversity. However, conservation of fruits certainly needs more government attention than what it currently gets. Research institutes lack funds for establishment of gene banks or to carry out conservation programmes. "Through the years, a large amount of germplasm has already been lost. Though there have been national programmes to collect fruit diversity, efforts have been sporadic. There are still many fruits out there in the wild," says Chadha. Many traditional and weedy species of fruits, which are prospective sources of disease resistance, are threatened with extinction. There are two types of conservation approaches: in situ and ex situ. Conservation whereby plants are grown in their natural habitat is in situ or on site. However, in situ conservation is difficult especially in large areas where diversity exists in abundance. An in situ sanctuary, especially for citrus fruits, has been established in the Garo hills of Meghalaya, However, horticulturists feel that this is a waste since only one type of citrus fruit is found in the Garo region. The major conservation approach should be ex situ conservation where the seeds are wither-dried and preserved in controlled conditions in field gene banks or in a laboratory where it is grown under artificial conditions. These seeds are then tested for viability by planting them out every few years. The whole idea is to ensure that local cultivars (a cultivated variety of a plant) and wild varieties can be saved over long period of time, and yet be available to breeders when required (see table: Banking on genes). Seeds of most tropical fruits are recalcitrant - that is, they are no longer viable after the drying process. Storing plants by multiplying them by vegetative methods is a more tedious process and success is not guaranteed. Biotic and abiotic stresses coupled with an apathetic attitude towards conservation have already taken their toll on a large gene pool of the few citrus species that are native to India. Also, monoculture of economically important species is threatening the existence of many lesser known species. Some national attention to genetic resource activity has resulted in the development of some commercially cultivated varieties, but more needs to be done. Also, the government should be made aware of fruit diversity being a part of national wealth. Collection and conservation of genetic diversity as well as improvement of species to increase economic value should be a national priority, feels Chadha. The department should try to repeat the her revolution with other less preferred fruit species too.  deforestation. A lot of genetic erosion has taken place due to deforestation and urbanisation. Wild varieties of cultivated fruits existing in forests and other rural areas are important sources of germplasm which can be tapped for improving cultivated varieties. These varieties are mostly disease-resistance, pest-resistant, have a better colour, taste, flavour, and longer shelf life. Clearing of hedgegrows which once served as diversity banks, and land off its natural vegetation for construction of dams, roads, railways and houses are mainly responsible for genetic erosion.  commercialisation of a few varieties of a few fruits, many of them not even of Indian origin. Owners of orchards or large plantations are switching over to these varieties. This has been observed in the case of the declining citrus groves in the north-easten states and the old mango orchards of Uttar Pradesh, West Bengal and Andhra Pradesh.  changing food habits leading to changing demands is resulting in a greater demand only for few varieties.  conservation of fruit diversity is not a priority research area.  share of the finances allotted to agriculture is hardly commensurate with the requirements, even with the export that fruits earn. For the Ninth Five Year Plan, horticulture has been allotted 7.7 per cent of the agricultural budget, while fruits comprise 25 per cent of agricultural exports. "We could definitely do with some more resources," says Chadha.  proper genetic assessments leading to effective utilisation of tropical fruits have not been carried out.  specific ethnobotanical studies have not been carried out, nor have locally useful diversity been assessed to promote socio-economic gains to rural communities.  efforts at exploring diversity within fruits is pitiable. This includes the search in fruits like citrus, banana, mango, tamarind, ber, aonla, karonda, jamun and ker.  stepping up of germplasm exploration, collection and conservation centres.  characterisation, evaluation and documentation of the conserved germplasm.  intense research on protocols for conservation, identification and characterisation of the species.  setting up of a central germplasm information system backed by a network with data in store.  pressing for financial assistance from the government.  developing a market, especially for lesser-known fruits. As of today, some genetic diversity still exists in fruits owing to the large geographical area, diverse climate conditions and nature of origin. However, given the government's apathy towards the survival of fruit varieties as well as a host of other factors, there is no guarantee that the scenario will improve or not deteriorate in the near future. Many of the fruits savoured by the children of the sixties and the seventies, leave alone earlier generations, are not seen any more. Take phalsa, for instance. Gobbling a handful of phalsas into your mouth and relishing the tangy taste while allowing your mouth to turn red is just one of the many memories associated with fruits of yore. And as for khirni, when was the last time you saw it in the market?